"It's becoming mass-audience, it's becoming more pop culture"
Competive gaming is a booming industry. Now, Philadelphia will soon be home to an arena dedicated solely to a video game franchise. Check out the preview. In many ways, he's a lot like other professional athletes. He spends countless hours honing his craft, jet-setting to far-flung venues to play in front of large, boisterous crowds. He signs autographs and takes selfies with admiring fans. But this is no conventional sportsman playing a conventional sport. This is Cormac "Doolsta" Dooley. Only 18 and not even out of high school yet, he's part of a growing industry — once derided by some parents as a mindless waste of time — that has quickly exploded into a global, lucrative profession: esports. "Even if you win one $50,000 tournament, that's pretty much some people's wages for a year. So there definitely is a lot of money to be made," Dooley said. Competitive gaming has become so profitable in recent years that large media companies are getting in on the act. Comcast Spectacor announced Monday that it will build a dedicated esport stadium in the heart of the South Philadelphia Sports Complex. The 3,500-seat, $50 million Fusion Arena will play host to local professional team Philadelphia Fusion — already owned by Comcast Spectacor. 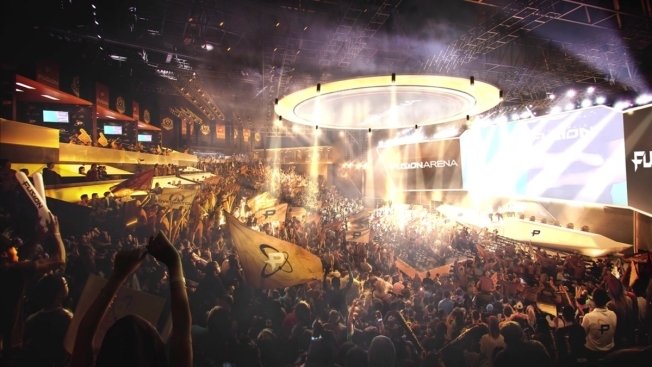 "This will be the first ground-up [esports] facility in the western hemisphere," Spectacor Chief Business Officer Joe Marsh said. The 60,000 square-foot arena, slated to open in 2021, also will feature a training facility and represents another revenue stream in the ever-expanding competitive gaming ecosystem. A rendering of the exterior of Fusion Arena. For a city like Philadelphia, an arena will likely mean added revenue, said Rob Johnson, the chief marketing officer for N3rd Street Gamers, a Philadelphia-based company that's taking advantage of a hole in the still-developing esports market. Just for the amateur tournaments that N3rd Street hosts, both players and spectators travel from around the country, thereby boosting local economies, Johnson said. Last year, the Barclays Center in Brooklyn sold out more than 20,000 tickets for the grand finals of the Overwatch League, in which gamers compete in the popular Blizzard Entertainment game "Overwatch." A professional venue in Philadelphia, according to Johnson, could attract a global audience. "The exposure is to Philadelphia. They need to stay somewhere in hotels. They need to eat somewhere. So the economic impact is very, very high, I would believe," he said. "I made the switch over to N3rd Street Gamers a couple months ago knowing that the over double-digit growth year after year of competitive gaming, it's not slowing down," Johnson said. Johnson spent years doing marketing for the NFL and NHL before making the switch to the competitive gaming world. He said the days of video games being perceived and derided as a hobby reserved for recluses playing alone in their basements are gone, replaced instead by an ecosystem that's churning out cash for those who know how to capitalize on it. Professional-level esports are predicted to generate $1.1 billion in 2019 through a combination of sponsorship and media rights deals, game publisher fees and advertising, merchandise and ticket sales, according to gaming research agency Newzoo. Thirty-seven percent — or $409 million — will be generated in North America alone, Newzoo predicts. Newzoo's figures don't take into account the money that could be made outside of professional-level competitions. Other avenues also exist, including the monetization of non-competitive gaming through services like YouTube and Twitch, the latter of which was bought by Amazon for $970 million in 2014. "Still," Newzoo notes, "live streaming around non-organized competitive gaming is an exciting industry in itself, full of its own developments." Even Google has gotten in on the action. The company recently announced its intention to launch Google Stadia, a streaming service akin to Netflix but which would instead allow people to play games without needing a traditional console. The rise in competitive gaming has been spurred largely by changing, nonlinear media consumption habits from younger generations, Johnson said. "The eyeballs are shifting to a different medium, and a lot of that is becoming video games." Newzoo predicts that this year, 453.8 million people will watch professional esports globally. By 2022, it expects that audience to balloon even further, to 645 million people. This has prompted traditional companies to shift their own eyeballs in the direction of esports. Fusion Arena is only the latest in a series of moves by Comcast to capitalize on competitive video gaming. In 2017, the media giant announced the creation of the Fusion, which competes in the Overwatch League. Last year, Disney announced a multiyear deal with Activision Blizzard to air the Overwatch League playoffs and finals on ABC, ESPN, ESPN 2 and Disney XD, bringing competitive video games to television screens. But though traditional media conglomerates are pouring big money into the industry, there's still a lot of room for others to take advantage of the changing landscape. N3rd Street Gamers' niche, for example, is largely in player development. Unlike traditional sports, which began at the amateur level and gained popularity before players ever considered themselves professional, modern esports took the opposite route, Johnson said. "With esports, it seems that it just went pro and then the infrastructure wasn't built to get people there," he said. N3rd Street's goal is to bridge that amateur-to-pro pipeline by eliminating barriers to entry for causal gamers. "Gaming can be expensive. A lot of the high-end PCs, they're thousands of dollars each," Johnson said. To help ease the financial burden, N3rd Street allows people to play at its "Localhost Arena" in Northern Liberties. Here, players not only have access to modern gaming equipment that they might not otherwise be able to afford, but they're also provided with opportunities for training bootcamps. Last year, the company also announced the creation of the National Championship Series, a series of amateur tournaments throughout the country that provides cash prizes and tracks player development through a points system. Dooley was himself one of the beneficiaries of N3rd Street's work. Last year, he was a 17-year-old fan of the popular EA Sports franchise "FIFA." The West Chester East High School student was good. He often beat his friends, but he wasn't a pro. Then came the Union Esports Open, in which Major League Soccer team Philadelphia Union worked with N3rd Street and Independence Blue Cross to host a tournament that would determine which player would represent the team at the eMLS Cup. 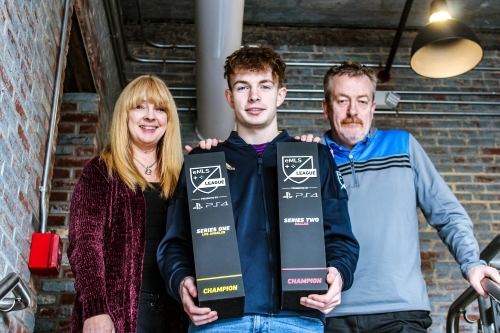 Cormac "Doolsta" Dooley poses with his parents. "I didn't really realize I was a top-level player until I won the Union tournament, where I beat a pro in the final who was one of the best in America," Dooley said. Following that win, he not only got signed by the Union, but managed to sway his previously unconvinced parents. Like many older non-gamers, they didn't quite understand what all the hype was about. "They didn't like me playing that much. Even when I'd be sick from school or something, sometimes my dad would just think I was faking and take the controllers because he didn't want me playing," Dooley recalled with a laugh. But then they saw the crowds — and the prize money. Dooley was now able to come to his parents and say he wanted to quit his job as a bus boy making $5 an hour plus tips in order to play FIFA. It's been a whirlwind since. Now he gets flown to Boston, Atlanta, Dallas, Los Angeles, Paris and Bucharest. He's pretty certain he'll qualify for a tournament that takes him to Berlin. Today, he's competing for a triple-figure pot in London. Last week, a tournament win scored him $10,000. Not bad for a high schooler. "It is completely surreal," Dooley said. "When I look back at this time last year, I was working hard like most high school students, just at a restaurant or something, and now flip the scripts onto a year and I'm making a good bit more money than what I was making there doing that." All that was born from one video game tournament. Even excluding the win bonuses, players at these tournaments — even at the amateur or semi-pro level — can still benefit from the exposure to sponsors and even college scouts who might be watching in the crowd. This embrace of esports by institutions of higher learning — to date, 135 accredited U.S. colleges are listed as being a part of the National Association of Collegiate Esports — underscores another indication of esports' staying power: it has permeated into everyday life, with no sign of stopping any time soon. Soccer superstar and French World Cup winner Antoine Greizmann has embraced the "take the L" celebration found in "Fortnite." Lakers player Josh Hart has taken to the court in his own custom Fortnite shoes. Former UFC flyweight champion Demetrious Johnson has his own channel on Twitch. Some gamers have become transcendent millionaires. Last year, Tyler "Ninja" Blevins became the first professional esports player to grace the cover of ESPN Magazine. "It's becoming mass-audience, it's becoming more pop culture," Johnson said. These days, it's no longer a question of whether or not competitive gaming can catch on in the mainstream. Increasingly, it is the mainstream. Disclosure: Comcast is the parent company of NBCUniversal, which owns this TV station.